Free ebook offers designers practical solutions for working with bad clients. Just as Dante had to struggle through the nine circles of hell in the Divine Comedy, graphic designers can find themselves in their own inferno of frustration when dealing with difficult clients. Clients who expect designers to be constantly at their beck and call, or who turn minor tweaks into full-blown emergencies, for example, can spoil an otherwise rewarding creative assignment. With that in mind, a free new ebook from Route One Print called The Design Comedy: How to deal with the 9 stages of client hell offers practical advice for taming even the most hellish client. 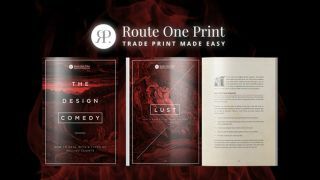 Route One Print takes a literary approach to the important topic, splitting nightmare clients up into nine types – named after the nine circles of hell in Dante’s Inferno. Not only does the ebook identify the types of clients who can cause designers headaches, it also offers expert advice on how to work with them productively. With The Design Comedy, you’ll learn how to overcome common client-designer problems and turn these into opportunities for learning and improving your business skills. For example, when dealing with fraud, author Tyson Beck suggests: "As a freelancer, don’t hesitate to provide your client with a different solution to what they’re suggesting you do. The client isn’t always right, and your service to them shouldn’t just fall to an execution of their ideas." So don’t let difficult clients ruin your projects – learn how to forgive their ‘quirks’ and move forwards. Download the free ebook The Design Comedy: How to deal with the 9 stages of client hell by Route One Print and take your working relationships from hell to paradise.